If you’ve ever had the pleasure of watching Dez Bryant practice you can tell that football is extremely important to him. Everyone knows that Dez is an extremely passionate player, but few mention the type of leader he truly is. Dez has never done anything in his life halfway, it’s full speed no matter the circumstance. He leads in a way very similar to the Cowboys’ Hall of Fame receiver, Michael Irvin. When you look at this team with the camaraderie they built last season, the commitment they’ve all made to team football, it’s got Dez’s imprint all over it. He’s led the charge, creating an incredible bond with his teammates and he’s on the verge of something even more special. Just to add to Joseph’s point, there are reasons to believe that Dez Bryant is not only back to being himself but should return to NFL dominance in 2017. The chemistry between a receiver and quarterback is not built overnight. Before Dak Prescotttook over for Tony Romo, he was passing to the guys trying to make the team. Dak and Dez barely had any time together before it was GO-time. Let’s focus on the way Dez Bryant ended last season because it’s not always about how you start, it’s how you finish. 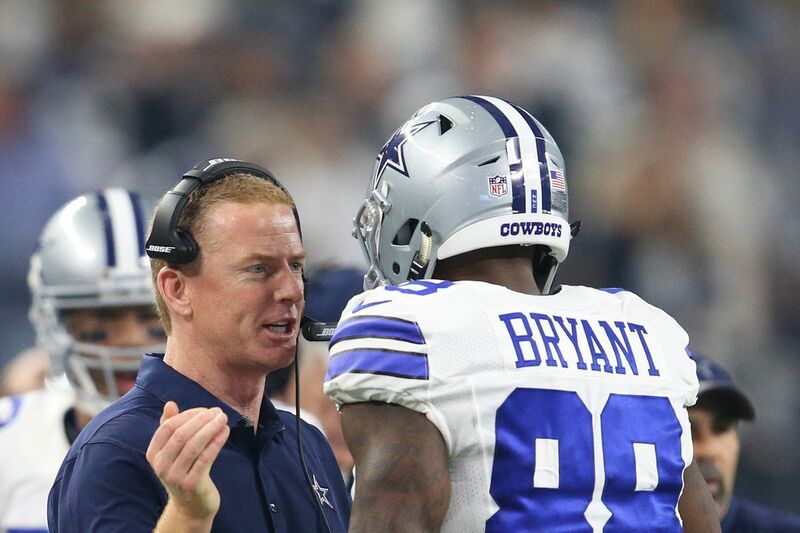 After returning in week eight, Bryant wasted no time in getting back on track. In a 29-23 overtime victory over the Eagles, Bryant averaged 28.3 yards per catch, had four receptions for 113 yards and a touchdown. In the final 10 games, Bryant scored seven of his eight touchdowns. He had dominating performances against the Steelers, Ravens, and Lions. Speaking of that Detroit game, Bryant scored twice but also threw his first career touchdown pass to Jason Witten in that 42-21 rout of the Lions. In only one postseason performance, he was PFF’s second-highest rated postseason receiver with a rating at 156.3. Of course, it was against the Packers, who were 31st in pass defense. Still, nine receptions for 132 yards and two scores is a big time performance. If you’re one to criticize Dez for beating up on a weak defense, let’s just remind you that Odell Beckham Jr.only had four receptions for 28 yards a week prior against that same defense. “The transition to Dak Prescott turned out to be tougher than most expected, as Bryant and Prescott connected on just 16 of their first 41 targets in their first five games, or 39 percent. If you ignore their first five games together, removing the Week 17 game where both Bryant and Prescott played one series, here’s what their final eight games have totaled (playoffs included): 66 targets, 43 receptions, 646 yards, and eight touchdowns. As Dak and Dez have more time together, their rapport is going to grow stronger. Bryant averaged 15.9 yards per catch last season, that’s about a full yard more than his previous career high. Bryant also replaced Julio Jones in the Pro Bowl. Another interesting side note: Do you know who was PFF’s third-highest wide receiver based on passer rating when thrown to? It’s not Dez Bryant, it was Terrance Williams (124.6). That just tells you the amount of respect that is paid to a guy like Bryant as his mere presence makes the offense better. “Of the three catches Norman did allow to Bryant, two of them moved the chains and the other picked up nine of the necessary 10 yards on first down. He may not eclipse his amazing numbers of 2014 but this is still every bit of the All-Pro he always has been. Whether it’s game day, on the practice field, in the weight room, or an interview: Dez Bryant is special. The way he finished off his 2016 season shows you that there is plenty of gas left in this tank. This is the guy that is second in the league in touchdowns (67) since he was drafted in 2010. Next article Cowboys’ Down-Roster Battles: Who Will Be The Last Quarterback To Make The Roster?